HELP KEEP THIS SITE ON LINE! 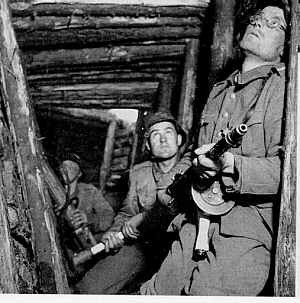 The battles at Tali-Ihantala in June-July 1944 were the largest ever fought in the Nordic Countries. The battlefield comprises 100 sq. km. At the focal point the five Finnish divisions were fighting against 12 Soviet divisions. So the battle was larger than that of El Alamein, for example. That makes 24 pieces for a front of 4 to 6 kms. In the focal point of battle the Red Army had in average 130 to 150 artillery pieces plus 59 rocket launcher barrels per front kilometer, that makes 520 to 900 field pieces plus 230 to 350 rocket launcher barrels for the same 4 to 6 km length of front. However, at Tali-Ihantala the Finnish artillery was able to concentrate the fire of all the 250 guns available in any single target within range in matter of minutes. As to air forces, the Soviet Air Force had 1500 fighters, bombers and ground-attack planes. The Finnish Air Force had 60 serviceable two-engined bombers and in average 30 airworthy Messerschmitt 109 fighters plus obsolete types. The Luftwaffe sent a task force of 35 Ju-87 Stuka dive bombers and 35 FW-190 Jabo fighter-bombers. The Red Army had about 450 tanks and assault guns, the Finnish Army had 25 German assault guns and a dozen captured T-34 and KV-1 tanks. For the 3rd Brigade 1658 casualties of the original complement of 6055 men (27% losses) For the entire Finnish Army 8561 casualties, of which 1101 killed and 1096 missing. The Soviet losses are estimated to be 18 000 to 20 000 casualties, and about 600 tanks. This is a front-line dugout. It consisted of a timber frame sunk in the ground and covered by a layer of logs, then waterproofing, sand padding and more logs. To make the structure withstand a direct artillery or mortar shell hit, the topmost layer comprised of biggish stones. This particular dugout seems to be quite low. The probable reason is that to avoid ground water or due to the omnipresent bedrock it could not be dug deeper. It is quite dark, too, because windows would have provided a path not only to light but to enemy shells. Dozens of thousands of Finnish soldiers lived in this kind of billets from late 1941 to June 1944. Q. Could you tell me about your family background? A: I am the oldest child, born in 1923. I have a five years younger brother who became an opthalmologist, and a ten years younger sister, who is in catering business. My father was employed in timber trade. During the First World War he was a sailor. He was hired in a Norwegian ship bound to Norway, and the convoy was attacked by German subs. My father's ship managed to get to Hammerfest undamaged. From there he arrived to Finland, just to be drafted in the White Army: the civil war was just being fought. Q: Were you born in Helsinki? A: Yes, but I spent 10 years of my life in Oulu where I went to school in the Oulu Lyceum. We moved to Helsinki in 1938 and I continued in the Finnish Lyceum, matriculating in spring 1941. Q. Were you involved in the Civil Guard? A. Yes, I belonged to the Boy's Detachment of the Oulu Civil Guard, because I was interested in building and flying model aircraft. I applied for service in the Finnish Air Force, but I was not accepted. Q. Was the outbreak of the Winter War a surprise ? A: The war was a total surprise for the people in Helsinki. The government negotiators had just returned from Mowcow and we were expecting another negotiation round any time. On the 30th November, a Thursday, we were just in the morning service in our school as we heard the sound of aircraft engines just past 9.00 hours. We ran to the windows to look, someone told that he saw two-engined Russian bombers. The headmaster ordered everyone to take shelter in the school cellar. As we were in the staircase on our way down, a bomb exploded on the Kalevankatu street just in front of our school and every window on the street side was smashed in. We languished in the cellar for a couple of hours until the oldest boys began to ask what we were doing there since the war had broken out. Our teachers gave permission to leave home for those who dared to go. I ran from the school (near the center of Helsinki) to my home in Munkkiniemi (in the northern suburbs). The streets were littered with splinters of glass. Near the Bus Terminal I saw dead and wounded people, and an AA machine gun fired at the top of the Post Office Building. 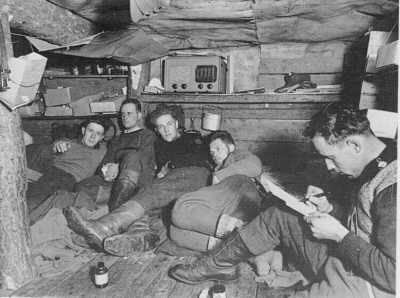 On my way home I had to take cover in an air raid shelter once. On the same day the University of Technology, quite near our school, was burnt down. Q. So you did not get in the Winter War? A. No, but I was working as Air Raid Warden in Helsinki just as my father did. My mother and the younger childen left on foot as "evacuees" for relatives in the evening of the first day of war. Q. Great Britain declared war on Finland on our Independence day (6.Dec.) 1941. Do you remember it as an remarkable event? A. It was a most annoying piece of news. In our opinion the leaders of Great Britain had totally misunderstood the role of Finland in the war. Psychologically we did not understand that declaration of war, we were expecting help from the Western Powers against the aggression of Soviet Union. Q. You were called up on the 12th December 1941. Was the inspection done properly? A. I cannot blame the physical inspection, it was matter-of-factly. Even though I was and am small (160 cm height) and quite light, I was considered to be well-developed and I was classified as A1 (the best class). Q. You were mobilised on the 15th January 1942. You were trained in the Infantry Training Camp no. 17 in Hamina. How tough was the training? A. In my opinion the training was aimed to build up our fitness and create a sense of community. I do not think I experienced any bullying. We fired live ammunition in the rifle range, of course, and I do not remember of any battle training where we would have used blank cartridges. The training took some weeks. Then the entire batch of recruits were posted to the Third Brigade, stationed near Karhumaki (Medvedogorsk in Russian) in Eastern Carelia. My rank was Private and my task was Sub-Machine Gunner. (The weapon was SMG Suomi mod. 1931, caliber 9mm). A trench in the Svir river front section in 1942. Q. Where did the men hail from? A. Most of us were from Helsinki. The 3rd Brigade comprised the remains of the Vallila Battalion (the plus-forty men had been demobilised), but some men came from the region near Turku and Somero. Our company included also older men. Q. Did you get decent gear and equipment? Q. Were you put to front line duty immediately? A. No, our company was in the reserve. I was selected for NCO training, whereafter I was given the stripes of Lance Corporal and a squad (7 men) to lead. Soon after that our company was sent to the front line. A. The enemy used to send patrols to catch someone as prisoner and gave us artillery fire. We did likewise. You had to beware of the enemy snipers all the time. Q. How often did you get furlough? A. The normal time between furlough was six months, but you could get extra for military prestation, for your marriage, to visit your newborn baby... The furlough was 14 days, travelling included. I travelled twice to Helsinki and back with train (forty-eight hours in one direction) which was really full. Q. Finnish soldiers received a daily allowance (12 FIM a day, less than the lowest industrial hourly wages), but did you really need money while in the front line? A. Just for tobacco. Everyone was given 3 cigarettes a day, whether you smoked or not, but you could buy more. I, too, started smoking, under peer pressure. The tobacco was an important item, it was needed " to soothe one's nerves". Q. How strict was the formal discipline observed, for example saluting? A. Soldiers saluted their superiors smartly, but I should say that in front line there was not very much formality applied, neither by the commanders nor by the rank and file. The men did not try to seek favours by overtly military behaviour, we did not exaggerate. - When in reserve, closed order drill was practiced. We also had sports and competitions. In general the drill and training was leisurely paced, aimed to maintain fitness. Q. Was every man expected to participate in sports? A. No, only the best men were selected to represent their unit in competitions. Also artists and men with artistic talent had a chance to perform in "front shows" . When in reserve, sometimes we had a chance to go and see the shows of professional troupes. A. Yes, some men for example fashioned lampshades from lumpy pieces of birch, but in our dugout we had only a couple of men interested in carpentry. Most men played cards and read books in their free time. Q. Did you try to continue your studies during the war? A. No, because I was fully occupied in soldiering. I did not have too much time. For example I read all military manuals and standing orders in order to be updated and well-informed. Q. Did you consider entering military career and applying for Cadet School? A. No, because I am so small. It would be difficult to stand in front of troops without being laughed at by bigger boys. Such is life. Q. Can you tell about your first battle, or when did you fire at the enemy for the first time? A. Shooting with a SMG is summary shooting, a SMG gunner did not aim at a single man. When attacking, SMG gunners would run ahead of everyone else to avoid shooting at own men. I do remember an incident in about March 1943, as an enemy patrol got behind our trench and approached the door of our dugout. I was in a shooting position as a flare illuminated the scene. I saw a shape wearing snowcape and immediately I fired with my SMG. Six enemies shod with felt boots were left there, the rest of the patrol managed to escape back in their own lines. Scene from a trench in Liipua (Rautu), Carelian Ishtmus, in June 1944. The men are set for a counterattack. The SMG gunner is waiting for the moment the last shell of the artillery preparation explodes, then he shall step forward and start rolling the trench that the enemy has taken. The man behind him is going to throw hand grenades behind every "elbow" of the trench as they proceed. The machine gun being held by the third soldier in the rear is a captured Maxim-Sokolov m/1910 (recognisable by the fluted water jacket). -I remember well my first wilder war experience. Our company, in reserve, was ordered to retake a hill near Malu Railway Station that had been lost to the enemy. It was an about 250 m broad hill with a trench dug on top. It was about 200 to 300 meters from our lines. 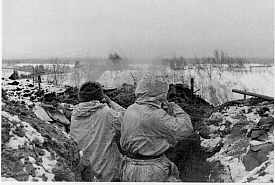 -We were in the takeoff positions in the evening dusk as the enemy fired a barrage at us with Stalin's Organ (40-barrel 122mm rocket launchers). The rumbling was really deafening, the enemy had found out what we were about to do. Our own artillery fired, too, but I believe we were not any better off than the Russians on the hill. Then we went over the top and began to run for the objective. I heard how someone shouted that the platoon leader had been killed, but we continued the assault. My squad reached the enemy trench. I told the others to roll the trench to the left, I rolled to the right. I threw hand grenades and fired with my SMG. Private Leander with his rifle (7,62x53R Finnish m/1939, a version of Mosin m/1891) covered my back so that we should not be surprised behind. Q. Did the enemy leave any dead behind ? A. Just a few, they were in the bolt holes. In the evening dusk we saw how enemy soldiers climbed out of the trench and ran toward the rear as we rolled the trench. Then I ran out of ammunition, I had spent all my five magazines. It was quiet, nobody fired. We came back in our steps in the trench and shouted for ammunition replenishment and sought contact with others. Nobody answered us, nobody could be seen, we found that we were alone in the taken trench. From the enemy side we heard loud noise and commands, we supposed that they were preparing for an attack. -I did not have any ammunition, Leander had some for his rifle. We decided to leave, just as the others had done. We could not accomplish much with a single rifle. We returned to our starting positions after midnight. During this "operation" our battalion commander was on furlough. -As Major S.O.Lindgren returned to his unit and was told what had happened, he ordered a new attack. He gave a pep talk to the men of the attack force and assured that this time we would not retire. The major must have remembered me from the days of the NCO course since he asked whether Lance Corporal Hyry agreed. I confirmed that I agreed, but I also said that this tiime we should be supplied with ammunition. "That is true", the major admitted and told that he would join Hyry's squad for the attack. -The same evening we attacked again, and the battalion commander ran next to me. As we jumped down in the trench, the major ordered to make that spot the ammunition replenishment place. Then he told me to roll the trench to the right while he rolled to the left. We took the trench and held it for three days and nights before we were relieved. During that time we repelled a counter-attack. Q. While holding the front line, what kind of unit was responsible for what length of trench? A. Our dugout housed a half-platoon (two squads of eight men) and we had about 250 to 300 meters of trench. At Malu Station it was dug in sandy soil and it was without revetments. The enemy trench was a little more than 200 m away. Q. Was it a proper dugout? A. It was dry and high enough inside, you could stand straight and there was a stove. We did not have any bed-bugs, I think we were men who knew how to take care of cleanliness and replaced their underwear in time. Q. Did you get to sauna? A. If I remember correctly, we had a sauna bath every week, even when we were in the first line. Q. Did you have barbed wire and mines in front of the trench? A. There were wire tangle defences, and they should have been mined, but I am not sure because we never heard any mine detonations. Q. Did you get sufficient food rations? A. Yes, nobody starved to death. In addition to Army rations we got post packets from our relatives and we shared these packets. For Christmas we used to get something special. There was a bread-box in the dugout where you could at will take dried rye bread (30x30 cm plates, about 5mm thick). We used to boil water in our mess tins on our stove and make tea of dried raspberry leaves. Then we dipped slices of dried bread in the tea. If you had any sugar from your ration to add, it tasted very good. Q. How did you spend your time in the stationary trench war? A. We had two hours of sentry duty every four hours. We had a pair of sentries at two places, no more in the night than during the daylight hours. Q. How were the soldiers informed about the course of the world war? A. 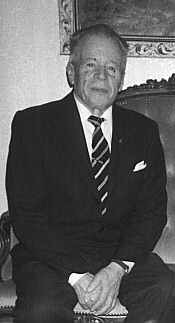 We were quite well informed about our situation, about the situation of Germans and about the general situation of the world. We were getting newspapers and we had a radio receiver. Nobody was uninformed, even though there were no information meetings. Q. 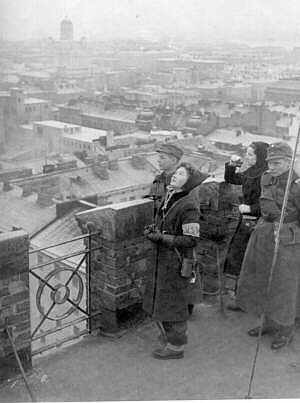 How were you affected by the news about the German loss in Stalingrad? Q. Did the men discuss the outcome of the war among themselves? A. Yes, we did. We feared that Germany was not going to win the war and it would end badly for us, too. On the other hand the Germans were not liked because the men thought they were too popular with the Finnish women. Q. Did the Soviet propaganda have any effect? A. None. Finns did not care about propaganda, be it their own or that of the enemy. Q. Did you listen to the Finnish transmissions of the BBC? A. No, it was just Allied propaganda, wasn't it? Q. You were in the front line during the winter of 1942/43, but then you were sent to the Officer School, thanks to special attention of the Battalion Commander? A. Yes, those with qualifications could volunteer for the Officer School, but I thought it was better for me to stay where I was. Yet the Major sent me an order commanding me to Officer training at Niinisalo. There were 1000 men in the course and I was the only one who had not volunteered. As the leader of my training platoon, an Aspirant, saw my documents he asked whether I was an unruly one? I answered that I did not think so, yet he took me as an object of his special attention. Q. What kind of memories did you get from the officer training? Would it have been better if you never got there? A. Good memories remained, despite the fact that in the beginning the instructor-Aspirant tried to discriminate against me due to my small size and make me appear ridiculous. Maybe he thought that an officer should have a showier frame. I belonged to the elite of the officer course, I was a member of the entertainment group which made program for the school evening shows: plays, gymnastic shows and so on. Q. You had energy for such activities, too? A. If we had followed the orders literally and obeyed the orders of the assistant instructors to the letter, we would not have been able to do anything else. But if you obeyed the orders according to your physical resources only, no problem. As the commander of the training company found out that the assistant instructor was bullying me, he involved in the matter. The instructor was reprimanded and I was made the orderly of the training company commander. Whenever there was unpleasant extra drill or training, I was sent for example to chop firewood. The course took nearly five months. Q. Then you were posted back to the 3rd Brigade, but to the Third Battalion instead of the Fourth? A. Yes, at first I served as Aspirant. I was promoted to Ensign on the 29th February 1944. Soon after that the entire Brigade was transferred to Salla in Lapland, to be used as reserve in the expected Soviet offensive. From there we were rapidly transferred to Carelian Isthmus in June 1944 as the Red army launched the offensive. Q. You became a Platoon Commander, was the previous commander killed? A. Quite a lot of them were killed. Q. What kind of group was your platoon? A. In the beginning the platoon included older men, but they were replaced with younger ones. I think I was very successful in my role as platoon commander. I used to "prepare" all matters and orders in depth and psychologically, taking into account the opinions of my men and boosting the "esprit du corps". The main principle was: nobody shall let down. If there was a weak link, there always was a "trusty" at hand. A weaker man was never left alone, there was always a stronger pal to back him up. - This method worked in my platoon. The spirit was good, if someone grumbled about something, I was immediately informed and the matter was discussed with everyone involved. The platoon was psychologically united. Q. Did you apply these principles as soon as you became a platoon commander? Q. Did you learn that in the Officer School? A. No, it was my own method that I resorted to because I was small in size and also interested in psychology. Q. What kind of relationship did you have with your company commander? A. Our relationship was good but for the fact that the commander was a cadre officer, who had sometimes problems in adapting in practice the orders received from the battalion commander. He was so theory-inclied that he was not able to relate the task with the resources available in practice. A few times I had to contact the battalion commander to be able to agree with my company commander how to act sensibly in the given case. The battalion commander had the general opinion that we must spare men and avoid brash action when in the front line. Often our company commander ordered more men than necessary for a mission, which resulted in casualties. I always reached agreement with my commander, although we disagreed in some matters. I also had courage to tell my differing opinion, and in case of a matter concerning all the platoon commanders of our company, it was me who dared to tell our common opinion to the Captain. Usually I attempted to tell about our common view instead of my own, thus I brought forward the opinion of the troop. Q. Did you have time for this during the battles of summer 1944? A. Well, there was some time but more often it was a case of not having superiors around to give you orders. A platoon commander had to act on his own and see to it that his platoon remained organised and the men did not run away. Q. So the 3rd Brigade was transported with train to Carelian Isthmus? A. Yes it was on the 15th June as the transport was unloaded at Kuolemajarvi station, as a matter of fact a little aside because odd movement was observed. Enemy soldiers were sneaking around the station house. The train left back immediately and we had to retreat 60kms to Summa, where we stopped at the Mannerheim line positions from the days of the Winter War. Those positions were weak, they had been haphazardly repaired after the destruction of the Winter War, but it was our only choice. (Fighting in these positions 18th to 19th June 1944). Retreating infantry marching in July 1944 in Eastern Carelia. They are under constant threat of Soviet ground attack planes, so they are not marching in neat formation. The rifles are mod. 1939 (rebuilt from the Russian 7,62mm mod.1891). -We were in the trench as the enemy fired a heavy artillery barrage on us and then in the direction of the road tried to break through with a very massive charge. They had remarkably great numbers of infantry and tanks, too. We were expecting support from our own artillery, but we did not get one single shell. The tanks kept charging and the infantry followed. We had no antitank weapons, yet we held the line. Our company commander was killed and I became his stand-in. I promised to Battalion Commander Ikonen that we are able to hold the trench up to midnight (of 18th June) but no longer. -We were relieved at midnight, it was ordered that the men are to be relieved one at a time, the coming man gives the relieved one a shove and takes his position. I thought this was a bad idea, considering that we were in battle contact with the enemy, and the result was that the relieving and relieved men were mixed up and everyone retreated. -I was in a concrete bunker next to the road trying to sort things out with the captain of the relieving company. It turned out that the captain did not have any battle experience, he was a rear echelon man and he had unexpectedly been posted as a rifle company commander. At that moment an enemy tank drove on top of our bunker and stopped. I went to the door with the company ordely and at the same moment a 75 mm antitank shell, meant for the tank on top of the bunker, hit the doorpost. The orderly was wounded in his left arm. I gave my SMG to the captain and said that he should see to it that nobody would come in our bunker, then I began to bandage the wounded man. Soon the AT gun fired again, this time the enemy tank was hit. Two survivors of its crew jumped in the trench and began to approach our bunker. As the tankers saw us they began to fumble for their sidearms. The captain shouted: "Rukiverh!" and I yelled "shoot!" He did, but one of the enemies got away. Then we agreed that we would retreat along the trench to the edge of a bog where a Maxim machine gun team, attached to our company, was shooting a barrage in front of the trench. I would disengage the MG. The men began to proceed downhill in the trench, the enemy tanks and infantry were 50 meters away. -The trench ended in the bog, and we began to retreat on it. The swamp was so wet that the men were not able to carry the Maxim and its tripod, but we had to dump them. We proceeded to North toward our own troops in the dusk of the summer night. All the time we heard the noises the Russians made when they advanced and talked. We did not talk, but kept moving among the Russians in the same direction as they did. Finally before daybreak we found our own troops. -It is very difficult for me to give an account of the happenings during the Russian offensive for one who has not been in a war and is not able to understand that anything can happen in a situation where your own and enemy troops are mixed up. I think the official history makes the case appear better than it really was. 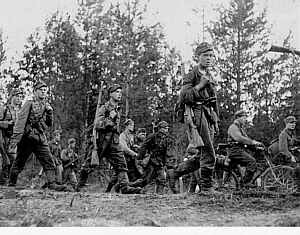 After the enemy breakthrough the Finnish troops were dispersed and they strived to get back in our own side in small groups while the Russians were advancing in the same direction. My platoon was fighting a kind of guerilla war when we attempted to get back to our own troops. We were able to break out because we had to attack the advancing enemy in the back - we were able to catch them by surprise. We tried to avoid the enemy, they were making quite a noise, but we engaged them when necessary. A few times, in the dusk of the night, we just walked through the enemy line in a single file, a couple of my men secured to the left and to the right. The Russians were no better informed than we were about the placement of their own troops, because there were no battle lines. If we met lost Finnish soldiers, I ordered them to join us until we got back to our own troops. Q. The next stop was at Tammisuo. Do you remember how long did it take before you got there? A. It may have been a couple of days, we did not get any rest during that time. There the Brigade received new antitank weapons, Panzerfausts and Panzerschrecks. These weapons were used by antitank men who destroyed 28 tanks in our front section. Q. How long did you fight in the positions of Tammisuo? A. For about one week starting the 20th June, we had a ready trench. We stopped the enemy and repelled their attacks, but the front broke at Viipuri. Q. The official history tells that on the morning of the 25th June 1944 the enemy fired an extremely heavy two-hour barrage on the front of the 3rd Brigade, from the front line up to the Saimaa canal in the rear. Then heavy (JS-2) tanks broke through the line and the enemy infantry followed. A. At that hour the situation was quite unclear, there were single skirmishes here and there. We had again no contact with our own troops, but we tried to retreat to the North. We had to cross the Lake Karstilanjarvi by the narrow point, there we suffered a lot of casualties because the enemy concentrated their fire on the spot that we had to pass. We saw some Finnish tanks of Lagus' Division and German Stukas. After that we fought at Ventela until the 9th of July. 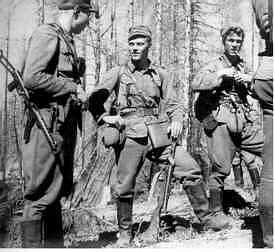 ( According to the official history four enemy divisions, 40 000 men if in full strength , against one already decimated Finnish brigade of initially 5000 men). From Ventel� our Brigade was transferred to Viipurinlahti in July. First we were near Viipuri, then at Keihasniemi. Q. So the enemy tried to cross the gulf? A. Yes, they employed landing boats and made use of the islands they had taken. We were quite heavily fired upon by direct-shooting cannons and at times by mortars. But our artillery stopped the enemy. The boats never got so close that infantry would have been able to shoot at them. Q. Did your platoon suffer losses? A. Yes, I lost half of my platoon. At Summa nobody was killed, because we had decent trenches. At Tammisuo we were worse off because we had to counter-attack to be able to disengage and retreat. Many men got killed there. Q. Could you evacuate the dead and the wounded? A. Many of them had to be left behind. All paramedics had been killed, too. Q. Did you get replacements? A. We got recruits born in 1925. I found they were worse soldiers than we were, inexperienced and thus careless. Q. Then the battles calmed down and you were posted to a special task? A. I became the farming and forestry officer in the brigade HQ. My task was to lead the harvesting and timber transports from the area to be ceded to the enemy. The potato and grain crop and the cut timber was confiscated by the government and transported by train over the new border. Everything had to be recorded and the records were inspected later by the Army Corps. The labour was provided by the civilians still remaining in their homes and soldiers assigned to me. Q. When did the war end for you? A. I was demobilised on the 8th November 1944. I had been in service for 2 years 11 months 13 days. I returned back to my home in Helsinki, it had remained undamaged, and I was able to continue my studies in the University of Helsinki. Q. You were decorated in September 1944, it was the Freedom Cross, 4th Class? A. I believe I got it for being a platoon commander, it was a dangerous duty. Q. Were all soldiers decorated? A. I believe those who had a clean service record were decorated. Q. How did the proviant supply function in summer 1944? A. To a great extent the commanders had to seek the distribution. There were signposts on the roadsides informing about supply points. Cooked food was available actually quite well, although we had to live on dry food at times. We made surrogate coffee and raspberry leaf tea with our mess tins over open fire. Q. Did you have any stomach problems due to bad water? A. During one period there was some dysentry. A lot of men had to be hospitalised, it even affected our fighting strength. Q. What is your strongest impression of the summer 1944? A. It is the huge numeric superiority that the Russians had. The tanks, the tremendous number of infantry and the ground attack planes (IL-2m). The planes sapped our moral and caused a lot of destruction by shooting with their cannons and dropping bombs. The pilots used to shoot at any buildings that could have been used as accommodations and also at anything that moved. Of course it was hard to be in artillery barrage and under fire from point-blank shooting cannons. Q. Did you experience any instances of total panic? A. I do not think I saw any cases of actual panic. It could happen that when one unit had received orders to retreat, another unit next to them had been ordered to keep their positions to delay the enemy. Usually retreating was organised and not pure flight. Then the delaying unit was threatened with encirclement. It was a real risk and not just fear, taking into account the enemy superiority. It was essential that the unit stayed together - for eventual breakthrough. For my part I must say that due to my psychologic leading the platoon remained together. Many times I was even feeling amused as the men gathered around me like chickens around a hen. Q. Did any of your men desert? A. Later it was found that some men, believed to have been killed because they went missing in action, actually deserted. Q. When men were killed in action, did you have to write to the next-of-kin? A. Yes, but not very often. Mostly that was the task of the company commander. Q. Have you had any contact with the men of your platoon after the war? A. No, because I was fully occupied in my medical profession. Q. Have you been in rehabilitation provided for the veterans by the government? Q. Do you have any mementoes from the war, photos or something? A. I did, but everything was burnt together with my house later. Thank you for an interesting interview! Keep this site on the web!